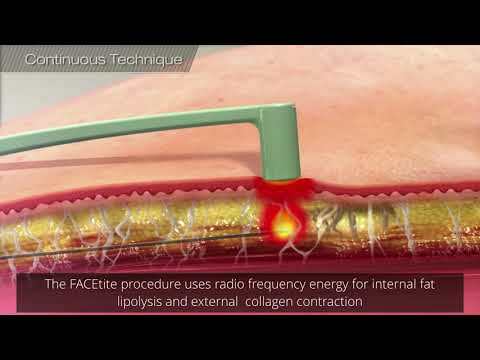 FaceTite is a radio frequency device that we use for tightening the skin of the face. As we age, our face has two basic changes. We lose volume to parts of our face, mainly the cheek areas. And then that translates, as well, with loss of collagen in our skin. Traditionally, this would be treated with a facelift or a mini facelift, or all these different spectrums of excisional treatment, which leave a scar, although well hidden, but a scar. With FaceTite, now we have a minimally invasive out-patient, in-office procedure one time. The simplest way to think of it is a scar-less mini facelift, which is an amazing tool to be able to provide to your patients. You're gonna come in, it's gonna be in the office. You're gonna be awake during the procedure. The first thing we do is we kinda numb the areas that we're gonna treat, and then during the treatment, you'll feel some warmth in the areas that are being treated. You'll be talking, and I'll talk you through the procedure as we go. You'll be in a compression garment for a couple of days after surgery and then at night following that. Takes about an hour and a half to do a FaceTite procedure. So, relative to the BodyTite that is bigger areas, we're focusing on a smaller area of treatment. It's a quicker procedure. We're promoting collagen growth in your skin, and we're tightening the collagen that already exists. The majority of the tightening is gonna happen over the first three to six months. We do before and after pictures, and they can see their progress over time, and see how powerful it is. And once that collagen stimulation starts at four to eight weeks and 12 weeks out from surgery. For the right patient, you get a better, more natural result without the incisions and without the head surgery look. FaceTite - How Does it Work?